Gastroenterology Associates of Pensacola achieved Exceptional Performance for their 2017 MIPS submission by leveraging the Population Care | Quality Measures solution. Our Quality Measures solution helped enable the busiest endoscopy center in Florida to achieve a perfect Quality score for MIPS while maintaining optimal workflow, a win-win for both the practice and the gastroenterologists. SPH Analytics, the top ranked MACRA and MIPS Technology vendor, today announced that an abstract about its Quality Measures Medicare solution for MIPS will be the subject of a poster presentation at the 2018 Annual Scientific Meeting and Postgraduate Course for the American College of Gastroenterology (ACG), which is taking place October 5-10 in Philadelphia. The abstract, titled Excelling at MIPS Reporting and Quality Improvement, was submitted by Amanda Taylor, EHR Specialist at Gastroenterology Associates of Pensacola in the Practice Management Abstract Category. 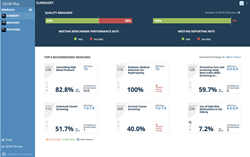 Gastroenterology Associates of Pensacola, achieved a 100% score for the Quality performance category and Exceptional Performance for their 2017 MIPS submission by leveraging SPH Analytics’ Population Care | Quality Measures solution to monitor quality measures and improve care gaps and gaps in documentation from their AllScripts EHR and practice management system. The author will be available for questions during the presentation time period.